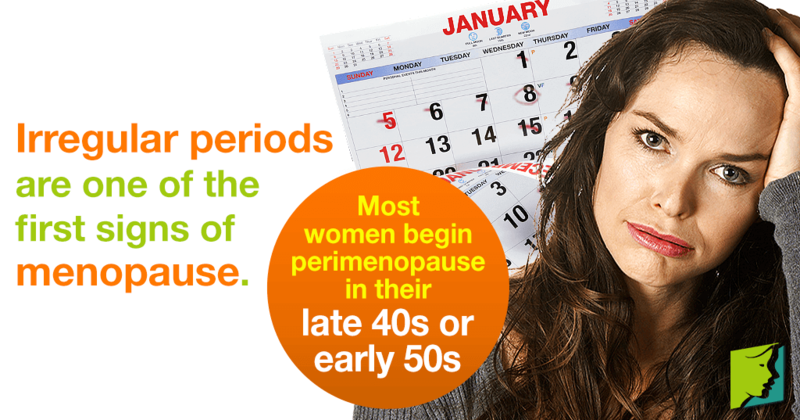 If you are near the age of 40, it's possible that you are experiencing perimenopause symptoms. Irregular periods are one of the first signs indicating that a middle-aged woman is approaching menopause, a natural transition in all women's lives. Read on to learn more about perimenopause, menopause, and irregular periods at 40. Why Am I Having Irregular Periods at 40? Most women begin perimenopause - colloquially referred to as menopause - in their mid 40s or early 50s. Since the transition is different for everybody, some women go through it quickly with few or no symptoms at all, while others experience symptoms for years into postmenopause. During perimenopause, women's bodies experience hormonal imbalance, which can lead to many common symptoms such as hot flashes, night sweats, mood swings, vaginal dryness, loss of libido, and - most famously - irregular periods. Fluctuating levels of the reproductive hormones estrogen and progesterone disrupt the menstrual cycle. This can lead to infrequent periods, too frequent periods, heavy or light blood flow, longer or painful menses, and more. You should not be surprised if you experience irregular periods in your 40s as they are common at this age. However, having irregular periods doesn't necessarily signify that you will experience any other menopause symptoms. Since not all women suffer from symptoms, it's possible to have erratic periods at 40 yet not experience any other signs or symptoms of menopause. When in doubt, talk with your doctor and take a blood test to figure out if you are menopausal or not. Are There Other Causes of Irregular Periods? The average age at which a woman hits menopause is 51. If you are between 40 and 50, then you are likely to go through this natural transition soon, and your irregular periods may be attributed to menopause. Talk to your doctor to identify the cause of your irregular periods and to address any concerns. In addition, it is important to remember that women can become pregnant even if their periods are irregular as long as they are still ovulating. All in all, at 40, the most likely scenario is that you are entering the menopausal transition, and irregular periods should not be a cause for concern, though they can be a nuisance. Click on the following link to find out more about treatments for irregular periods related to hormonal imbalance. Learn more about anemia and if anemia can cause irregular periods here. Also, find out how to resolve the health condition safely and effectively today. Dressing during your periods can be a challenge. Keep reading to discover some tips about dressing for irregular periods.